Haomei is one of the trustworthy concrete mixer truck suppliers in China, the concrete mixer truck manufactured by Haomei has compact structure, advanced technology, convenient operation, excellent in performance, elegant appearance, and has the ability to transport concrete with various slumps and various labels. The HM series concrete mixer trucks is a special vehicle that is equipped with a power take-off, a reducer, a hydraulic pump and a hydraulic motor system and an operating system on the chassis to realize the loading and unloading and transportation of concrete. 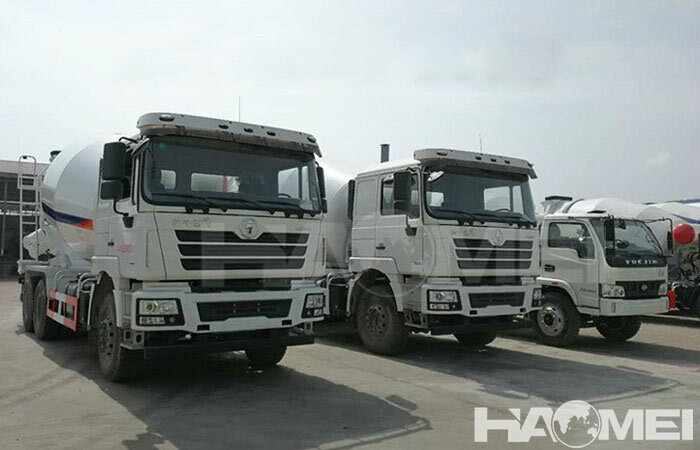 The imported hydraulic parts are optional, can transport different quality concrete at the same time, the tank material can choose carbon steel, impervious steel, manganese steel, etc., to meet the needs of transporting different concrete. With the increasing pollution of urban environmental pollution, various localities have introduced regulations on the control of dust pollution control in construction projects. Among them, there are regulations that prohibit the construction of concrete mixing of open-pit artificial goods in construction sites, and adopt a system of centralized supply of commercial concrete. This not only ensures the quality of commercial concrete, but also facilitates civilized construction to improve production efficiency, as well as reducing environmental dust and other pollution. At the same time, with the large-scale construction of commercial concrete batching plant, it also provides great business opportunities for concrete mixer trucks. With years of experience, the concrete mixer truck suppliers can help you to choose the suitable model and type with reasonable price and long using period, to trustworthy supplier, the machinery quality is guaranteed, the after sales service is professional. Prev: How is the quality of concrete batching plant made in China?